Pizza Rock is one of the relatively new businesses that have opened on Sacramento’s perpetually struggling K Street Mall. While some of the new businesses seem to be unable to shake the death pall that looms over most businesses that open then close on or around K Street, I am pleased to report that this is an exiting place that just might stay open (Fingers crossed!). 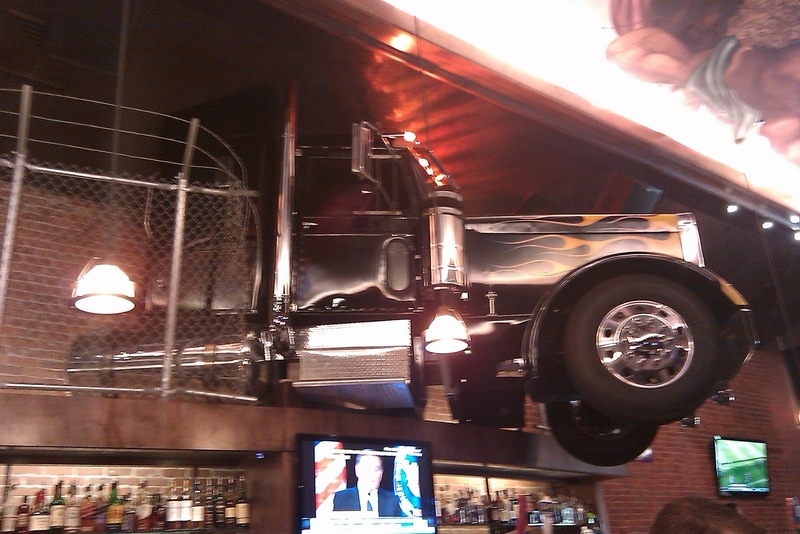 I am so impressed by the restaurant that I, once again, am presenting a scooterless burger review. It is kind of like a Hard Rock Café (another failed K Street venture) meets pizzeria with the music turned down enough decibels that you do not have to yell at your company across the table. 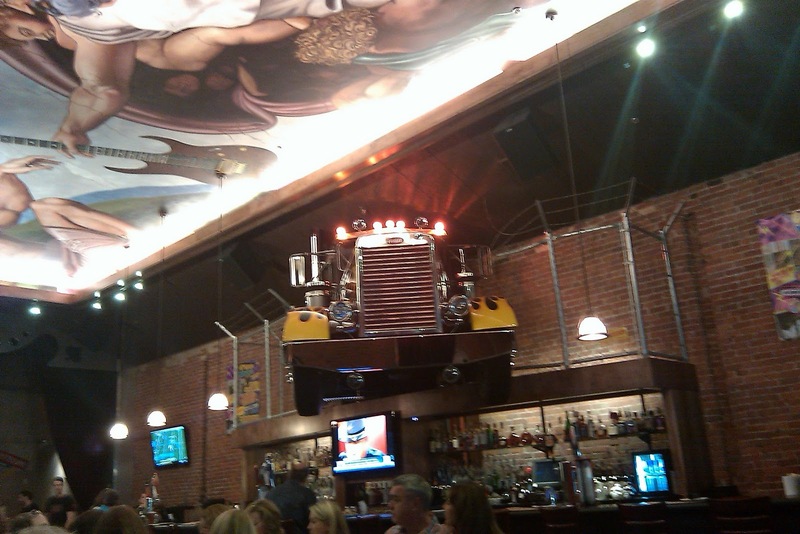 The digs alone offer promise, with the semi truck jetting out of the wall above the bar and the dough-throwing theatre, of sorts. I have had pizza here and it is one of the very best in Sacramento. Pizza Rock offers three distinctive hamburgers: the Gorgonzola Burger, the Burrata Burger, and the Calabrese Burger. Despite the fact that the selections get lost among the menu’s sea of pizzas, pastas, and salads, these burgers are noteworthy. I was so taken by the Gorgonzola Burger that I thought I would review all three here. 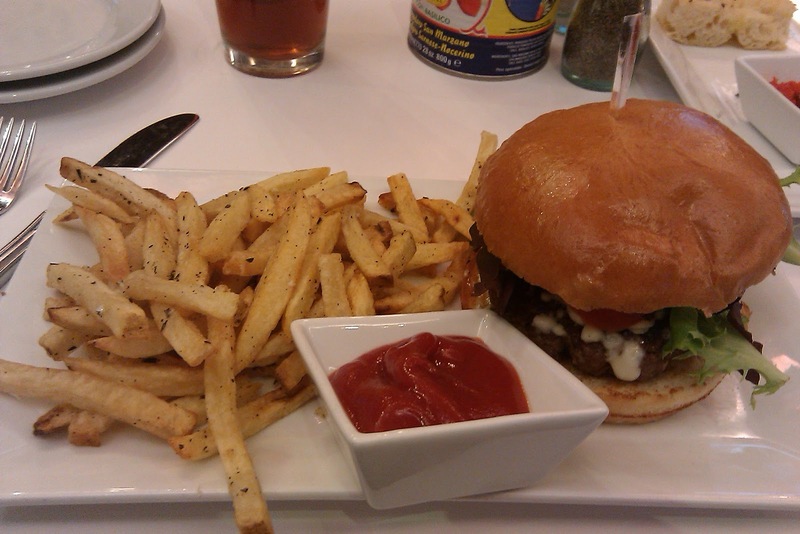 The Gorgonzola Burger is at least a 1/3–lb. Kobe beef patty, Gorgonzola cheese, pesto mayonnaise, romaine lettuce, and tomato on a very good and durable bun. The pesto mayo is subtle, not overbearing, so it does not conflict with the unique Gorgonzola cheese taste. The Gorgonzola Burger does not come with pickles or onions—which maybe wise omissions, since the Gorgonzola would not have worked well with these elements. If I have a complaint about this burger, it would be that the chef has a tendency to go a bit overboard with the Gorgonzola. I have had this burger twice—once it was terrific but another time it was a little too much. Still, I will definitely come back for this very good burger. The Burrata Burger sports the unique combination of the creamy Italian cheese, bacon, caramelized onions, the aromatic arugula instead of lettuce, and balsamic reduction along with the excellent Kobe beef patty and bun. I found the Burrata Burger to be good, but no match for the Gorgonzola Burger. The Calabrese Burger is a recent addition to the menu. With its Kobe beef patty, mildly sweet-spicy barbecue sauce, cheddar, two slices of bacon, and Calabrese peppers, this burger is a great combination of savory, sweet, and spicy tastes. 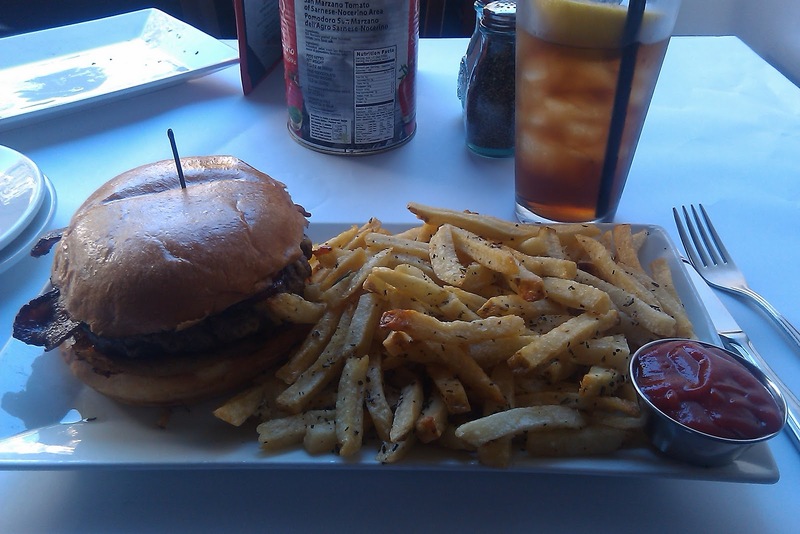 All burgers are served with perfect rosemary, sea salt, and garlic fries. The combo comes to $12. I also had an iced tea, which bumped the total damage to a little over $16. You can add another patty to your burger for an extra $3.50, but all of these burgers have filling elements in them that do not really require more protein (This is coming from a real glutton!). Most people would not think of ordering a burger in a notable pizzeria that has cloth napkins and serves bread with olive oil, but sometimes the obvious choice may not be the best. Once I heard someone ordering lobster at Austins Steakhouse when my wife and I treated ourselves to one of the best steakhouses in the area. I thought, “That sounds good, but this is a steakhouse and a damn good one…that guy should order a rib eye and leave the lobster to McCormick and Schmick’s or the Firehouse.” I found out the next day from a local restaurateur that Austins is the best place in the area for lobster. So do not be discouraged from ordering one of these burgers (especially the Gorgonzola and Calabrese) at a top-notch pizza joint. By the way, check out Pizza Rock’s Web site: http://pizzarocksacramento.com/. It is one of the most interesting restaurant websites I have ever seen. On October 15, I was using a bike to ambulate my wife’s dog (and let’s make it perfectly clear that this is not my dog) and the crazy canine bolted across the front of the bike. It caught the leash between the front wheel and the fender and I went down hard. While I didn’t break anything (I think), I may have fractured something in my lower left leg, re-injured my ribs (that’s another long story), “tweaked” (for lack of a proper word) my left hand, and ran up a total of seven abrasions. Although I never thought this humble blog would become the Huffington Post of scooters and/or burgers I did hope to attract a few followers outside of family and friends. This has not happened so far. In the meantime, another site has popped up on the web having to do with local hamburger fare. Burger Junkies is an excellent website with superior photography and a sophisticated rating system. Rodney Blackwell’s passion for hamburgers and food photography really shines through on this site. I am now a devout follower. Check it out: http://burgerjunkies.com/. ‹ PreviousNot Cool, Miller Lite!